Clara Peller may have left the building, but before she left she made sure we all got the message by asking, “Where’s the beef?” in her raspy, distinct voice. Television commercials were her medium, but the rest of us have to rely on a more old-fashioned approach (or YouTube, I suppose). Why let the fat cats in the meat establishment decide what should constitute a burger? 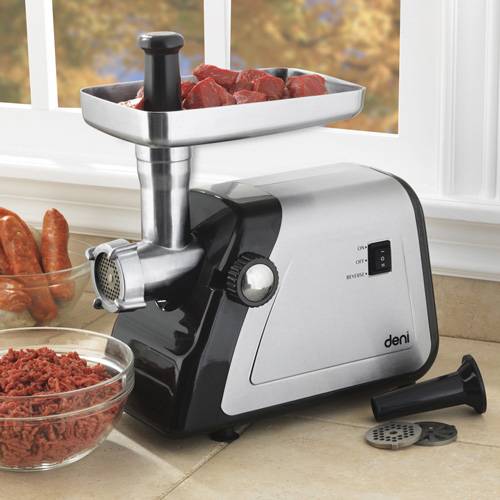 With the Deni Professional Meat Grinder, you can decide for yourself. Create custom sausages or burgers by grinding beef, chicken, venison, turkey or anything else you can think of. Or, just stick with the classics and grind your own fresh chuck daily. With an 800-watt motor that grinds up to three pounds of meat per minute, you’ll be enjoying better, tastier and safer burgers and sausages in no time. 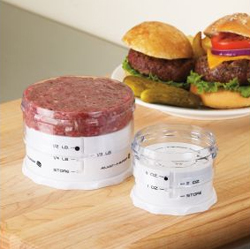 The counter-top kitchen appliance comes with three die-cast grinding discs for making everything from breakfast sausages to Polish and Italian sausages, and of course, ground beef for burgers. Buying ground beef in bulk is a sure-fire way to stretch your burger dollars. Best of all, when you make burgers at home, you get them exactly the way you like them. Just try getting finely chopped onions mixed into any fast-food burger. Like a splash of Worcestershire sauce to round out the flavor? Forget it if you ain’t making it at home. 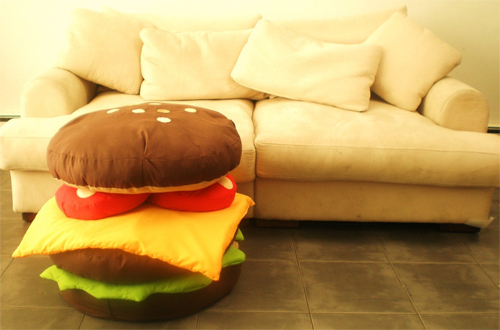 No matter what your favorite burger recipe may be, there’s a good chance you are going to need a storage solution. Since ground beef doesn’t come in packages rounded to an exact appetite, it’s usually appropriate to buy more than you need. Having frozen burgers patiently waiting in the freezer is a comforting thought to burger lovers. 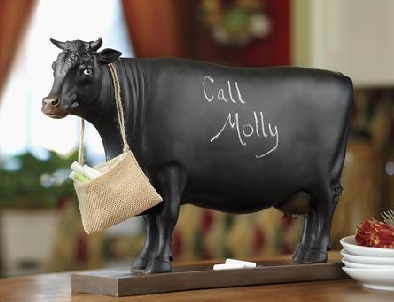 You are going to need something to keep all those emergency burgers from sticking to each other. 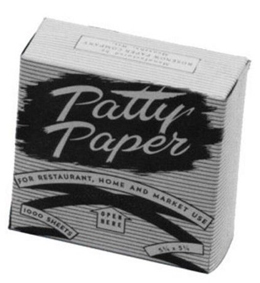 Johnson-Rose Hamburger Patty Paper is designed to do the trick. At a cost of $15.00 for a pack of 1500, no matter how much you love burgers you should be covered for the foreseeable future. For an add-on cost of a penny a burger, I think it’s a well-spent investment. Just look at that picture. Doesn’t that look crazy delicious? Those loaded peppers would certainly look great on my grill. 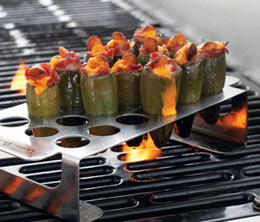 Just imagine a few juicy burgers cooking alongside this Chile Pepper Grill Rack. Now that it’s grillin’ season, it’s time to consider the deliciousness that is to come in the months ahead. From the looks of this grill gadget, I believe roasted peppers deserve to be included in every single grill session to come. The stainless-steel Pepper Rack holds 18 peppers and is dishwasher-safe. The rack measures 10-inches by 4.75-inches, and holds the peppers at a height of 2-inches. It will cost you twenty bucks to get your hands on this accessory, which is a small price to pay considering how hard it is to stand a dozen and a half peppers on end. Burgers are a thing of beauty. Perhaps no other common food item (except maybe pizza) can be so uniquely individualized as the burger. From topping selection to how well you like it done, everybody has a preference when it comes to how they like their burger. Whether you like your burgers rare with minimal toppings, or well done and slathered with condiments, there is one additional factor to consider when it comes time to choose your basic burger options: How hungry are you?